Documented throughout time and across cultures, dreams experienced by those on the verge of death can offer profound insight into the process of dying and provide deep spiritual solace for the individual passing away. In Dreaming Beyond Death, Kelly Bulkeley and the Reverend Patricia Bulkley bring together their diverse areas of expertise to create a guide to pre-death dreams that offers practical advice and provides a broader understanding of this phenomenon. Beginning with a look at dreams and dreaming in culture, history, psychology, and modern dream study, the authors show us that pre-death dreams tend toward three themes: dreams in which death is represented as a journey; dreams in which a guide appears; and dreams involving obstacles that parallel concerns of the dying in real life. They draw on Patricia’s ten years of hospice counseling to take us through the pre-death dreams of several terminally ill people, show us how to explore the meanings of dreams, and tell us why these particular dreams gave their dreamers a sense of resolution and tranquility. The last chapter provides clear, practical advice for caregivers on how they can respectfully guide those close to death through their dreaming experience. Rev. Patricia Bulkley’s experience as a spiritual counselor lends this book a deeply personal and human touch, while Kelly Bulkeley’s intellectual framework makes it easy to understand the larger meanings behind pre-death dreams. 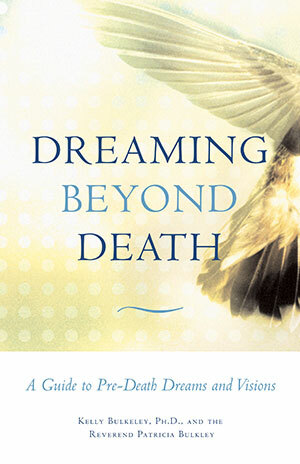 Suitable reading for both the dying and for their caregivers, Dreaming Beyond Death brings to light a distinct and profound part of the dying process. From this book, we come to see that understanding pre-death dreams can not only provide comfort, it can also lead ultimately to a profound sense of peace. "This highly readable volume is a treasure trove of compelling, original insights to excite the mind and the spirit through the journey of dying, healing, and hope. I cannot recommend it highly enough." "By investigating the metaphor-making power of dreams, this profound book not only bridges life and death, emotion and reason, science and the care of the dying, but the generational difference between this wonderful mother-son team of authors. Dreaming Beyond Death is a great contribution to both science and the challenge of facing death." "In earlier days in Western culture, there existed an Art of Dying. It got lost. Dr. Kelly Bulkeley and Rev. Patricia Bulkley help us recover it. They show how dreams can move us beyond thresholds, carrying us like vehicles into the unknown. Dreams cloak us in almost-understanding and in mystery. They speak to the heart and whisper us along the implacable path. At a moment when guidance is of the utmost importance, dreams speak. This book makes them accessible. I took up this text just to skim through it and became utterly engrossed, reading every word in one sitting."